Bunche Beach Preserve is a stretch shoreline, mangroves and salt flats managed by the Lee County Parks Department. It is also an important stop-over spot for migratory shorebirds including plovers, sandpipers, dowitchers, red knots and others. Recently a long-billed curlew has reappeared, and a few whimbrels were spotted last Saturday and there was the American Flamingo that showed-up a few weeks back. Today I missed these birds but did enjoy watching several others including a pair of Red Knots, a trio of Snowy Plovers and a dozen or so Marbled Godwits. Sadly the remains of a small loggerhead turtle was also seen at the beach today. Florida Fish and Wildlife should be collecting the remains. To report dead or injured sea turtles, or, if you have accidentally hooked a sea turtle that is small enough to rescue, contact: Florida Fish and Wildlife Conservation Commission at 1-888-404-FWCC, or call Turtle Time, Inc. 239-481-5566 immediately. Today, Bob Pelkey and I visited the Bird Rookery Swamp Trail on C.R.E.W. property near Golden Gate in Collier County. We hiked a mile or two, enjoying the cool weather, the beauty of the swamp and the birds. There were lots of Northern Parulas, Great Crested Flycatchers, Red-shouldered Hawks, Swallow-tailed Kites, Purple Martins. White-eyed Vireos, Common Yellowthroats, Belted Kingfishers and the many expected waders species. Additional many species of butterflies, dragonflies and wildflowers added to the day. Yesterday, reports came out about the sighting of a Cuban Pewee, a rare vagrant to the U. S. being seen at Crandon Park in Miami. The bird had been seen in the same area for the past two days, so there were a few birders, including Dave and Tammy McQuade, Dennis Peacock, Lee, Neil Hayward, Leslie Starr, Joe Turner, Trey Mitchell and Larry Manfredi, who, today, waited for hours for a return visit of the rarity at the anointed sight. After seven hours Bob Pelkey and I gave up, as had most everyone else. Hopefully it'll be relocated soon. The park was loaded with lots of exotic birds and reptiles. Larry Manfredi was telling us that this location had once housed a mix exotic waterfowl and other birds. The surviving population included a large number of feral Peafowl and Egyptian Geese. Plus we observed several specimens of Spiny-tailed Iguanas of varying sizes. On the beach, bordering the Biscayne Bay, were several gull and tern species including Herring Gulls, Lesser Black-backed Gulls, Laughing Gulls, Ring-billed Gulls and Royal Terns, Also present was a large gathering of Double-crested Cormorants, and a few Brown Pelicans. Recently visited a friends' feeders and noted that the Indigo Buntings and Goldfinches are molting into their summer colors. Soon.these fellas will be heading north along with the Yellow-rumped Warblers, Blue-headed Vireos, Belted Kingfishers and American Kestrels. 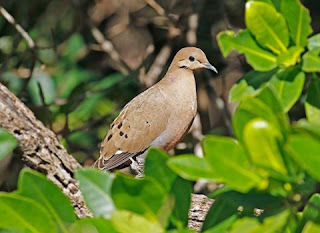 An ABA Code 5 bird called a Zenaida Dove, a Caribbean bird, has been very consistently reported at Long Key State Park Park down in the Florida Keys. Today, Bob Pelkey and I traveled the four hour drive from Ft Myers arriving at 8 o'clock as the park was opening. We located the staked-out spot that the dove is known to frequent. We shared the spot with a fella named Mark from Atlanta who was making his second attempt to see the bird, because he had dipped on it a couple of days before. A nice couple from Oregon were also waiting patiently. By noon Bob and I gave up and left the park. Heard from later from Mark that he had again dipped on the bird, even though he had stayed until dark. No Zenaida Dove seen by us today, but there were Hermit Crab races going on. We next left the Keys and headed to Lucky Hammock/ the Annex sight on Aerojet Road, outside the entrance to Everglades National Park. You never know exactly what to expect when visiting here. In the past it has been a great spot to watch raptors. We saw none today. One target we expected was a Brown-crested Flycatcher observed by friends a few weeks ago. The best we got was to hear its call. That counts but isn't as satisfying as getting a photo. Some birds we did see included Great Crested Flycatchers, Tree Swallows, Northern Flicker, Painted Bunting, Northern Parula, Blue-headed and White-eyed Vireos, Common Ground Doves, a Scissor-tailed Flycatcher and Western Kingbird. Bob spotted an unidentifiable oriole. Don't know if it was a Spot-breasted or Baltimore Oriole.